I don’t know how my review can do justice with this uniquely beautiful book. It is not going to be a long review because I am short of words to define how powerful this book was. I expected it to be good but this much wonderful, No I hadn’t. I am still astonished how easily author defines each and every character. Everyone is different from another bust justifiable. The most interesting thing about this book is every character is grey, No one is an angle. Still, you love some and dislike others. The flow of the story, the setting, writing, characters, ending, the narrator, text format, the way chapters were named, Everything was so Perfect. I’ll recommend it to each and everyone again and again. I loved your review! I’m planning on starting ‘The Book Thief’ later this month. Such an amazing book! I watched the movie first & adored it but somehow still managed to love the book even more :). Same here, I watched the movie first and loved it a few years back…Now I after reading book I loved it more. Such a beautiful book and such a beautiful review! I am going to read this soon. I love reading about this kind of thing. I can do with the emotion. I hope you’ll love it then. I’ve heard so many good things about The Book Thief. I definitely need to pick this one up. I have heard positive things about many book bloggers. Looks like I have to pick this one up. I hope it won’t disappoint you. I’m so glad to hear this book lives up to all the hype! I purchased this one earlier in the year and need to find time to read it!!! Great review. Great review. I really think I want to read this book. Great book. I have to admit I was turned off by the opening narration by death, but luckily I kept reading. Thanks for the review! It was opposite for me, the narrator instantly grabbed my attention. I am glad you liked it. One of my favourite books! It is such a beautiful, one of a kind novel. I am glad that you enjoyed this book as much as I did. definitely what i felt when i read this book too! I always meant to read this one and never got to it. Thanks for the great review! It is worth to read…I am glad you liked the review. Great review! This is a one hell of a beautiful book!!! 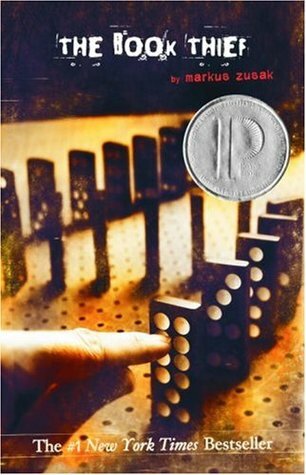 Great review, I heard amazing and great things about the Book Thief I am really glad you enjoy this book fully. Thank you so much for sharing your awesome post. I have read this book over a million times and I still can’t get enough of it . It always surprises me . Indeed it worth this love. Indeed it is . It was the first book I fell in love with . I have this on my list to read. Thank you for reviewing it. Thanks for the review. I’ve been intrigued by this book for awhile. It seems to be one of those books that’s so beautifully written, it’s almost poetry. Will have to move it up on my to-read list! It is indeed one of the most beautiful book, I never met someone who didn’t like it. Thanks for sharing your review with us. Short, crisp yet good enough to generate curiosity among the readers to go for this book. Well, at least I am definitely going to read it in case I find a copy. I am going to post my review on a book tomorrow. Time permitting, please do visit my page and share your views. I think what pulled me into reading ‘The Book Thief” was the blurb. I make it a habit to purchase books from the bookstores, and this one drew me to it. Nice review by the way. Well written. I read this book a few years ago, and didn’t like it, but this makes me want to read it again! Great review!! I really enjoyed this review, thought it was fair and honest and I like the images you used in it. I love this book one of my all time favorite! And I really like how you reviewed it. I agree with you. The Book Thief is such a beautiful book and it’s hard to describe how it makes you feel. Talking about old books I’ve read my mom’s copy of Little Women and now the spine is broken, pages yellowed and cracked. It’s the most beautiful book ever! Old books are so beautiful…I own so many old books some are 60 or 70 years old. From my uncle, he used to collect books from everywhere. I loved this book. I remember it kept coming up as a recommended book on Amazon when it first came out so I decided to buy it and was so glad I did. It’s been so long, time for a re-read I think. Great review as well!